Arm-in-arm with Vice President Biden, Sen. Mark Kirk, R-Ill., makes a dramatic return to Capitol Hill after suffering a stroke, cheered on by his peers as he walks up the steps of the Capitol building. 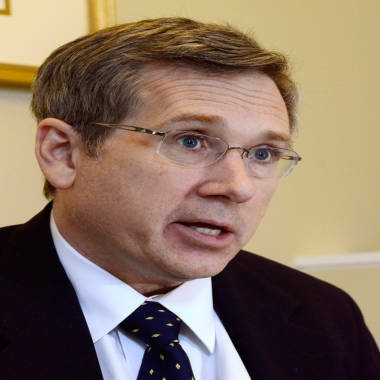 In the year since he had a major stroke, Sen. Mark Kirk has taken his recovery one step at a time. On Thursday, the Illinois Republican took 45 more – climbing the stairs to the Senate’s front door while colleagues cheered him on. “Yeah, Mark!” the crowd shouted as Kirk, 53, mounted the steps, slowly and stiffly, with Vice President Biden grasping his right arm. Kirk stopped several times along the way, leaning on a four-pronged cane for support. When he finally reached the top, he was greeted by loud applause. A year ago, Kirk would have bounded up the steps in moments. That was before the stroke that devastated the left side of his body and left him so close to death he saw angels – with New York accents – at his hospital bed. After months of rehabilitation, he speaks more slowly and deliberately, and his left side appears stiff. Kirk may have need a wheelchair to get around Senate corridors, but he was determined to get up the steps under his own power. “I’ve been dreaming of this day for months,” he told NBC Chicago earlier this week. 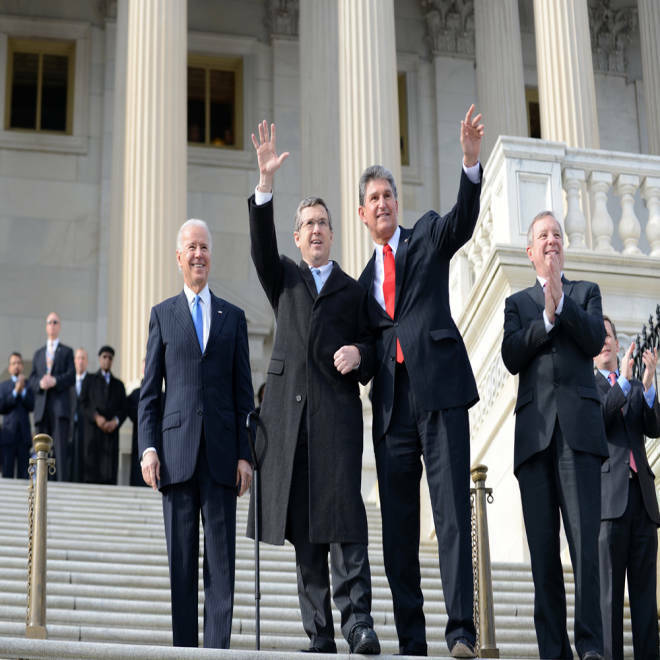 Illinois Sen. Mark Kirk, second left, waves as he is welcomed by Vice President Biden, left, and his colleagues upon his return to the Senate on Jan. 3 after suffering a stroke last January. The short trip to the front door was the end of long journey that he wasn’t always sure he would finish. "There was a time with my left leg when my doctors said, 'It will bear weight,' and I thought, 'You know, I'm the owner of this leg. Yeah, right. It'll never bear weight,’” Kirk said. “They were right and I was wrong," he said in a sit-down interview in Washington. The stroke he had last January affected the left side of his body but left his mental functions intact. He had three brain surgeries, and an 8-inch piece of his skull was temporarily removed to accommodate swelling. He said the ordeal made him more religious. "I felt like there were three angels in the room. And, interestingly, they had New York accents, probably because the last movie I'd seen was on Channel 11, was the original 'Ocean's 11,'" he said. U.S. Sen. Mark Kirk speaks about his recovery from a major stroke a year ago at his home in Highland Park, Ill. He replied: "No, I'll hold off." “They say there are no atheists in foxholes, and this stroke put me into a very deep foxhole,” he told the newspaper. Kirk, who was elected to the Senate in 2010 after five terms in the House, is living in a disabled-accessible apartment in Washington. He uses a four-pronged cane to get around and will scale back his schedule. The stroke, he said, did give him a new perspective on a major policy issue: health care. He said he still doesn’t support Obamacare but knows many of his constituents don’t have access to the top-flight medical treatment he received. "On the Medicaid side, how we address citizens of Illinois who suffer from a stroke ... working so that my fellow citizens have the opportunities that I had," he said.